It has been over a year since the adoption of the Sustainable Development Goals (SDGs) and the historic signing of the Paris Climate Agreement. Both of these events put forward a new agenda for development, and those who work in this field have been looking into the ways to navigate in this new context. So what is happening in Sweden in this respect and how can Swedish actors contribute to the realization of the ambitious development agenda on a global level? A group of Swedish actors who work with international development and environmental issues gathered in Stockholm to share opinions and exchange experience about their work on the 2030 Agenda. 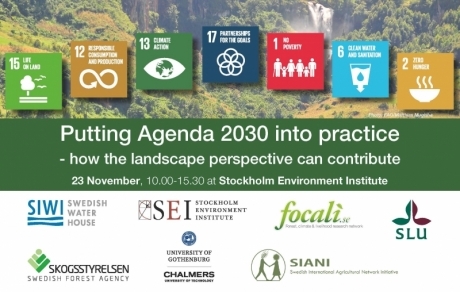 The workshop co-organized by Focali, SIANI, SEI, GMV, SIWI, SLU and the Swedish Forest Agency, particularly focusing on creating an open dialogue between actors who work with forest, water, agriculture, natural resources, climate, and development. Exchange about how the landscape perspective could contribute to an implementation of the new agenda for sustainable development was central to the discussions at the event. The day offered keynotes, interactive discussions, and case studies illustrating the topic from different angles. The 2030 Agenda and the landscape approach paint a picture of complexity and raise a lot of challenges, but there are also a lot of benefits in pursuing an integrated way of thinking. In the panel discussions during the workshop, the opportunities for landscapes approaches to overcome silos and work trans-sectoral were highlighted, as well as integrating the SDGs into national implementation plans. The need for smart indicators that can effectively measure the progress was raised by several panellists. And this is quite tricky if we are to work on the synergies between the Goals. Discussing early positive trends, all the speakers agreed there is a growing interest and involvement of the private sector. Businesses are often able to adapt to an emerging context well ahead of governments. Mayors and leaders on local levels also play an important role in implementing the new development agenda. Reconnecting rural and urban areas as well as establishing structures that pay proper attention to and support the youth remains challenging. There are other challenges too. A lot is still to be done in terms of data availability, transparency and general awareness about environmental issues. The bottom line, at least according to the discussions at the workshop, is that strengthening institutional capacity at all levels, from municipal to international, will be one of the cornerstones of putting the new development agenda into practice. Learn more from case studies! First out was a policy case presented by Torgny Holmgren, Executive Director at Stockholm International Water Institute (SIWI). He stated that “water is a connector and not a sector” and stressed the importance of trans-sectoral work. A recent call for financial and policy support to Green Water Management aims to “Regreen Africa South of Sahara”, where people are abundant but landscape productivity is low. Jan Lanéer, Coordinator at Swedish Forest Agency shared experiences from a very practical case; Helge Å Model Forest. In this project ways to solve brownification in the Helge å River Basement, covering three counties in southern Sweden. Experiences from the project tell that selecting and engaging stakeholder and agreeing on solutions is easier than financing the agreed activities. Support from private and public sector has to be secured in order to have impact. The final case study was presented by Toby Gardner, Research Fellow SEI. His research and the digital Trase platform (Transparency for Sustainable Economies) aims at reducing deforestation by tracking supply chains and connecting stakeholders to places where products are produced. This way, global players can connect to local landscapes, at a level tangible enough for decision makers to use. He demonstrated the Trase tool by visualizing sustainability risks associated with the trade in Soy from Brazil. The day included interactive discussions on collaboration initiatives shared by organizers and participants, they can be found here. You are most welcome to contribute to these initiatives where the dialogue and collaboration around the workshop theme can continue!